Ahead of the missile deal, the US had urged India not to purchase S-400 from Russia. It reiterated this Friday. 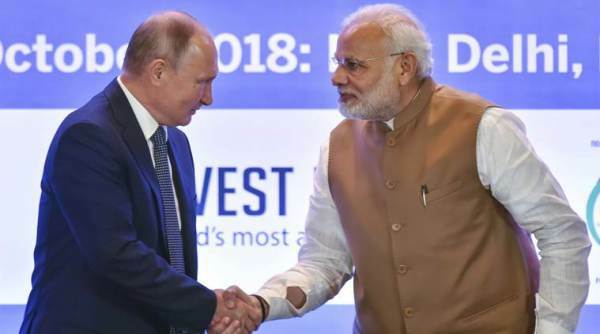 New Delhi: Prime Minister Narendra Modi shakes hands with Russian President Vladimir Putin during India-Russia Business Summit, in New Delhi, Friday, Oct 5, 2018. Washington: After India formally signed the mega $5.4 billion S-400 missile defense deal with Russia, which places it in the bracket of a potential American sanction, the Trump administration said the presidential waiver granted by the Congress in this regard is narrow and intended to wean countries off of Russian equipment. “The (CAATSA presidential) waiver is narrow, intended to wean countries off of Russian equipment and allow for things such as spare parts for previously-purchased equipment,” a White House National Security Council Spokesperson told PTI Friday, a day after India entered into an agreement to purchase state of the art S-400 missile defense system. The S-400 missile defense system would give India’s defense a cutting-edge security against any missile attack by its enemies. “India lives in a very turbulent and nuclear-powered region. S400 provides that assurance and is compatible with its current platform. Friends understand that these discussions with Russia started several years ago hence I do not believe US will impose sanction on India,” Mukesh Aghi, president of US India Strategic and Partnership Forum told PTI. But for the presidential waiver, Countering America’s Adversaries Through Sanctions Act or CAATSA sanctions kicks in in the event of a major purchase like S-400 missile defense system. Ahead of the deal, the US had urged India not to purchase S-400. It reiterated Friday. “The Administration has indicated that a focus area for the implementation of CAATSA Section 231 is new or qualitative upgrades in capability – including the S-400 air and missile defense system,” the White House NSC Spokesperson said. Last month, US had imposed sanctions on China for the purchase of S-400 from Russia. “Our recent action to sanction a Chinese government entity for an S-400 delivery underscores the seriousness of our resolve on this issue,” the spokesperson said. “The waiver authority is not country-specific. There are strict criteria for considering a waiver,” said the spokesperson. The State Department, which is tasked with reviewing the deal and initiated the process of sanctions or waiver under CAATSAA, and then recommend to the president, did not respond to the question on the time frame and the process. The National Defense Authorization ACT (NDDA) 2019 gives president the power to waive of the CAATSA sanctions if it is national security interest. It also lists out several other options for presidential waiver, prominent among which is the purchase country – India in this case –is taking or will take steps to reduce its inventory of major defense equipment and advanced conventional weapons produced by the defense sector of the Russian Federation as a share of its total inventory of major defense equipment and advanced conventional weapons over a specified period. In fact, over the last more than a decade, India the top arms purchaser of the world, has gradually reduced its dependence on Russian arms. It now stands at about 60 percent, which is much lower than it was a decade ago. United States has been a major beneficiary of this. As part of its diversification plan, India has increased its purchase of arms from the US from about zero to more than $18 billion. India is in the process of purchasing arms and equipment worth billions of dollars from the United States in the coming months and years including armed and unarmed drones and fighter jets. A presidential waiver can also be given if a country like India in this case is cooperating with the United States government on other security matters that are critical to United States strategic interests. Experts believe that is exactly the case and one of the main reasons for US designating India as a major defense partner. “I don’t like to make predictions in today’s Washington but sanctioning India, and surrendering the Indian defense market to Russia, would have exactly the opposite of the intended effect of CAATSA. No American interest group benefits from sanctioning India,” Benjamin Schwartz from US India Business Council told PTI. He has previously served as the director for India in the US office of the secretary of defense. Aparna Pande, from the Hudson Institute think-tank, said “I believe what is more likely is that even though India will sign the S-400 deal it will delay payment, etc so that the sanctions don’t come into effect. “This way India maintains its strategic autonomy and historical ties with Russia and yet ensures its strategic relationship with the US is not impacted either,” Pande said. According to Rick Rossow, from the Center for Strategic and International Studies think tank, said, “Congress widened the waiver criteria with India in mind, and the fact we had a robust 2+2 Dialogue in Delhi a month back shows that the administration believes in the momentum. “But ‘interest’ is not the same as action, and opponents to a waiver may now begin to raise their voices. So nothing is certain,” cautioned Rossow. “The 2+2 meetings and signing of the COMCASA agreement suggest warming relations between the US & India. But its pursuit of the S-400 missile defense system poses some thorny tradeoffs for the Trump admin: how to constrain one party without hurting another?” Caroline Baxter from RAND Corporation said in a tweet. The Russian Embassy in US tweeted that that the delivery of S-400 will begin in October 2020.